It's Friday! I've got a ton of work that just piled in and a visit to the dentist. You best bet that I'm looking forward to this day being over, ASAP! Today I'm excited to show you a polish from Oz by indie maker Gloss 'n Sparkle called Slowing Growing Deaf from the Discord Collection. For some reason I feel that Australian polishes are hard to come by, but with all the worldwide stockists, they actually easy to obtain these days. If anything, the difficulty lies in snagging them before they go out of stock, something I don't always have time for these days. So any Gloss 'n Sparkles that I come by are treasured, and I have Liz to thank for this one! 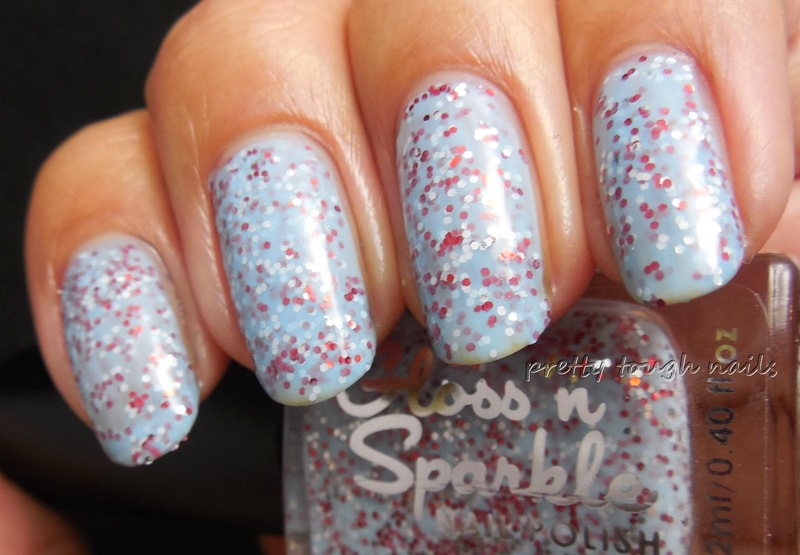 This beauty is a light robin egg blue creme embedded with tons of red and matte white tiny glitters. I had no difficulty with application other than some mild runaway glitters off the tips of my nails that I was too lazy to chase after. I used two nicely opaque here and finished with Gelous and GlitterDaze topcoat. I love the speckled look of this polish and the combination of colors together. Despite being red, white, and blue it doesn't seem overly patriotic either. In January, it has a wintery, fresh out of the holiday vibe to it. The color seems to elongate the length of my nails too. I can't believe how long they appear! It must be a combination of the shape and color that give that illusion. I can't say that's a bad thing, although it's hard for me to get use to seeing them this long. Do you have any colors that magically lengthen your nails? Wow, I love this! It is such a beautiful kombo with the blue and red (and white): Great swatch too. And yea, I do think some polishes make my nails look longer too, maybe some with glitter like this. And obviously striped nail art. This is such a unique color! I really love the combination of the soft blue base and the addition of the red glitter, which totally pops. Speaking of long nails, I wish mine were as long as yours! I'm back to stupid nubs because my nails were weak and they broke because of it. I just hate dealing with breakage. You have the perfect nails for showcasing this polish, Thithi! Long and slim with a well-defined shape shared across all of your fingers, it corrals the sweet glitter chaos of Slowly Growing Deaf beautifully. My nail shape is too amorphous and irregular to do proper justice to most glitter polishes. I confess my envy! It does make your nails look long, too! Perhaps because the glitters are so tiny?